This article is about the film. For the novel series, see A Series of Unfortunate Events. For the television series, see A Series of Unfortunate Events (TV series). Lemony Snicket's A Series of Unfortunate Events (also simply known as A Series of Unfortunate Events) is a 2004 American gothic dark comedy film directed by Brad Silberling. It is a film adaptation of A Series of Unfortunate Events by Lemony Snicket, covering the first three novels The Bad Beginning, The Reptile Room, and The Wide Window. The film stars Jim Carrey, Liam Aiken, Emily Browning, Timothy Spall, Catherine O'Hara, Billy Connolly, Cedric the Entertainer, Luis Guzmán, Jennifer Coolidge and Meryl Streep, as well as Jude Law as Lemony Snicket (the pen name of American writer Daniel Handler). Nickelodeon Movies purchased the film rights to Daniel Handler's book series in 2000 and soon began development of a film with Barry Sonnenfeld attached to direct. Handler adapted the screenplay and courted Jim Carrey for Count Olaf. Sonnenfeld eventually left over budget concerns in January 2003 and Brad Silberling took over. Robert Gordon rewrote Handler's script, and principal photography started in November 2003. A Series of Unfortunate Events was entirely shot using sound stages and backlots at Paramount Pictures and Downey Studios. The film received positive reviews, with many praising Carrey's performance, while some criticized its comical tone. The film also grossed $209 million worldwide, and won the Academy Award for Best Makeup. Lemony Snicket narrates the story of the Baudelaire children. Fourteen-year-old inventor Violet Baudelaire, her twelve-year-old bibliophile brother Klaus, and their mordacious baby sister Sunny are orphaned after a mysterious fire destroys their home and kills their parents. Mr. Poe, the family's banker, manages their affairs and leaves them in the care of their closest relative Count Olaf. Olaf is intent upon obtaining their family fortune, which will remain in the custody of the bank until Violet comes of age. He forces them to do chores and belittles them. Driving back from the court where Olaf has legally obtained custody of the children, he stops to go into a store, leaving them in the car parked directly on train tracks with a train heading towards them. They manage to divert the train by building a device to remotely turn the switch controlling the tracks. Mr. Poe arrives and takes them away. The orphans are taken to their uncle Montgomery, a kind herpetologist. However, Olaf arrives disguised as Montgomery's assistant Stephano. The orphans attempt to warn Montgomery, but he believes Stephano is after a large viper in his laboratory. Montgomery is discovered dead shortly after, his death blamed on the viper. They are almost placed in Stephano's care by Mr. Poe, but Sunny proves Stephano's guilt by showing the viper is harmless. Stephano escapes. Mr. Poe leaves them with their Aunt Josephine. Olaf appears disguised as Captain Sham to interfere with their plans again. One day, Josephine is not at the house, leaving an apparent suicide note entrusting them to Captain Sham. Klaus deduces that Olaf forced her to forge the note, but she left a hidden message revealing her location. They sail to the cave where she is hiding and rescue her, but attract leeches. Olaf appears and takes the children, throwing Josephine off the boat to the leeches. Mr. Poe finds Olaf with the children, and Olaf pretends to have rescued them. Mr. Poe is fooled and gives the children back to Olaf. Olaf plans a play titled "The Marvelous Marriage", that stars Violet and Olaf as a bride and groom. Klaus's suspicions reveal that Olaf is planning to take advantage of the play to really marry Violet in an attempt to get the fortune. Klaus manages to escape and finds a hidden tower in Olaf's house, with a large lens which, if positioned correctly, can focus the rays of the sun. He discovers this way that it was Olaf who set fire to their old house. He uses this window to burn the marriage certificate, leading to Olaf's arrest. However, a jury of his peers overturn his sentence and Olaf vanishes. Violet, Klaus and Sunny are taken to visit the burned remains of their old home one last time. A lost letter from their parents finally arrives, and inside is a spyglass announcing their family's secret society. Jim Carrey as Count Olaf, a villainous stage actor and master of disguise who lusts after the Baudelaire family fortune. Liam Aiken as Klaus Baudelaire, an intelligent bibliophile. He is the middle child of the Baudelaire siblings and uses his encyclopaedic knowledge to get them out of trouble. Emily Browning as Violet Baudelaire, a brilliant inventor. She is the eldest of the Baudelaire siblings and makes inventions out of everyday items. Kara and Shelby Hoffman as Sunny Baudelaire, the youngest Baudelaire sibling. She is a sassy infant with four very sharp teeth. Her dialogue is mostly subtitled as she communicates via unintelligible shrieks. Jude Law as Lemony Snicket, an introverted writer and the narrator of the story. Timothy Spall as Mr. Poe, a well-meaning but incompetent banker who informs the Baudelaire children of the fire and manages their affairs in its aftermath. Billy Connolly as Dr. Montgomery, an eccentric but kindly herpetologist and the Baudelaires' uncle and temporary guardian. Meryl Streep as Josephine Anwhistle, an OCD-stricken grammar stickler and the Baudelaires' aunt and temporary guardian. Catherine O'Hara as Justice Strauss, Count Olaf's kind neighbor and a judge. Cedric the Entertainer as the Constable, a skeptical detective. Luis Guzmán as the Bald-Headed Man, one of Count Olaf's minions. Jamie Harris as the Hook-Handed Man, one of Count Olaf's minions. Craig Ferguson as the Person of Indeterminate Gender, one of Count Olaf's minions. Jennifer Coolidge and Jane Adams as the White-Faced Women, two of Count Olaf's minions. Daniel Handler (the true name of the Lemony Snicket stories' writer and creator) cameos as a photographer. The film featured uncredited appearances by Jane Lynch as a realtor, Helena Bonham Carter as Beatrice Baudelaire, Gilbert Gottfried as the voice of a duck, and Dustin Hoffman as a critic. Author Daniel Handler initially viewed Count Olaf as being a James Mason-type. Carrey was not familiar with the book series when he was cast, but he became a fan of the series. "Handler's books are just a bold and original way to tell a children's story," the actor explained. Carrey was also attracted to the role despite self-parody concerns. Director Brad Silberling was open to Carrey's idea of improvisation for various scenes, especially the Stephano and Captain Sham alter egos. To make his prosthetic makeup more comfortable and easier to apply, Carrey shaved his head bald for the part. The actor's inspiration for Olaf's voice was combining the voices of Orson Welles and Bela Lugosi. Emily Browning was cast as Violet Baudelaire when she auditioned at a casting call in Australia. She was sent Handler's original script when Barry Sonnenfeld was planning to direct, and she screen tested for the part using an English accent. Browning became a fan of the books after reading Handler's original script. The actor was not cast until Silberling took over, then her character's accent was changed to American. Nickelodeon Movies purchased the film rights to the A Series of Unfortunate Events novel series in May 2000. Paramount Pictures, owner of Nickelodeon Movies, agreed to co-finance, along with Scott Rudin. Various directors, including Terry Gilliam and Roman Polanski, were interested in making the film. One of author Daniel Handler's favorite candidates was Guy Maddin. In June 2002, Barry Sonnenfeld was hired to direct. He was chosen because he previously collaborated with Rudin and because of his black comedy directing style from The Addams Family, Addams Family Values and Get Shorty. Sonnenfeld referred to the Lemony Snicket novels as his favorite children's stories. The director hired Handler to write the script with the intention of making Lemony Snicket as a musical, and cast Jim Carrey as Count Olaf in September 2002. The film suffered setbacks in development in December 2002. Rudin left Unfortunate Events over budget concerns. While Sonnenfeld and Carrey remained, Sonnenfeld admitted he was skeptical of Paramount's $100 million budget. The studio decided that changing the shoot from Hollywood to Wilmington, North Carolina would be less expensive. The April 2003 start date was also pushed back. Paramount eventually settled the situation in January 2003 by enlisting help from DreamWorks to co-finance the film, but Sonnenfeld vacated the director's position. Rudin and Sonnenfeld had no involvement with the film afterward, but were credited as executive producers. Carrey remained with approval over the hiring of the next director. "Very little of what I wrote is in the film, which I actually think is appropriate being as that I was writing it for Barry Sonnenfeld. It's a director's medium and Brad Siberling makes entirely different films from Barry Sonnenfeld. I wasn't filled with resentment because they didn't use it [my script], I was just disappointed because I'd worked a long time [on it] and Scott Rudin, Barry Sonnenfeld and I were all sort of ready to go, along with Jim Carrey, with the film that we had. So it was sort of a long, rocky, journey. But that's all [in the past]." Brad Silberling signed on to direct in February 2003. He was not familiar with the series when he was first approached. He quickly read the first three novels and was excited that "Hollywood was taking a chance to put over $100 million to adapt these inventive children's books onto screen". Handler, who wrote eight drafts of the script for Sonnenfeld, was replaced by Robert Gordon in May 2003. Handler approved of the changes that were made to his original screenplay. "I was offered credit on the film for screenwriting by the Writers Guild of America," Handler continued, "but I didn't take it because I didn't write it. I felt like it would be an insult to the guy who did." Filming was set to begin in October 2003, but it was pushed back. Principal photography for Lemony Snicket's A Series of Unfortunate Events began on November 10, 2003, using the sound stages and backlot at Paramount Studios in Hollywood. Director Brad Silberling avoided using too many digital or chroma key effects because he wanted the younger actors to feel as if they were working in a realistic environment. Olaf's mansion occupied two sound stages, while the graveyard and the ruins of the Baudelaire mansion were constructed on the Paramount back lot. After 21 weeks of shooting at Paramount, production then moved to Downey Studios, a former NASA facility in Downey, California, for eight more weeks. Downey housed the circular railroad crossing set complete with forced perspective scenery, as well as a newly constructed water tank complete with over one million gallons of water. The water tank was instrumental in filming scenes set at Briny Beach, Lake Lachrymose, Damocles Dock and Curdled Cave. Filming for A Series of Unfortunate Events ended on May 29, 2004. Some scenery was designed using forced perspective techniques, combined with matte paintings. Silberling, production designer Rick Heinrichs and costume designer Colleen Atwood all aimed for the film's setting to be ambiguous, giving it a "timeless" feel. Heinrichs also added steampunk designs to the period. To contribute to the setting, Silberling hired Emmanuel Lubezki as the cinematographer because he was impressed with the trio's work on Sleepy Hollow. Lubezki compared the cinematic similarities to Sleepy Hollow, notably the monochromatic look of both films. He also chose a specific color palette backdrop for A Series of Unfortunate Events. "The story is very episodic, so we picked a different color scheme for each section. For example", Lubezki continued, "Count Olaf's house has a lot of greens, blacks and grays; the house of Uncle Monty has a lot of greens and browns and a bit of yellow; and the house of Aunt Josephine has blues and blacks." The railroad crossing set was constructed on a cyclorama, which was the most ambitious setpiece for the art department on using elements of "in house" special effects and matte paintings. Industrial Light & Magic (ILM), supervised by Stefen Fangmeier, created the film's 505 visual effects-shots. The filmmakers used as few digital effects as possible, though the train and smoke for the railroad crossing scene was entirely created using computer animation. ILM also used color grading techniques for the Lake Lachrymose scene, which required complete animation for the leeches. The digital animators studied footage of the 2003 Atlantic hurricane season to accurately depict Hurricane Herman, which was ILM's most ambitious use of computer-generated imagery (CGI) for the film. Nexus Productions designed the opening "Littlest Elf" animated sequence by modeling it after stop motion animation and completing it with computer animation. The snakes at Uncle Monty's house were a combination of real snakes and animatronics. The animatronics, primarily the Incredibly Deadly Viper, were used as reference models that ILM later enhanced using CGI. Because working with infants was sometimes risky in producing a film, four scenes involving Sunny Baudelaire required CGI with motion capture technology. Among these are the shot of Sunny hanging on to a table by her teeth, catching a spindle with her mouth and the scene where she is entangled with the Incredibly Deadly Viper. Animation supervisor Colin Brady used his baby daughter for motion capture recording. A remote controlled animatronic of Sunny was also designed by Kevin Yagher. Another show of visual effects used for the film was in the opening with the 'littlest elf': stop motion filming was done for the film's beginning until it is interrupted by Jude Law, who as Lemony Snicket lets the audience know that the film they will see is most unpleasant. In October 2002, Nickelodeon Movies hired Activision (who actually had a partnership with DreamWorks) to create the film's tie-in video game. The agreement also included options for sequels. Director Brad Silberling delivered his first cut of the film to the studio in August 2004. Fearing his original version was "too dark", Paramount and DreamWorks conducted test screenings. The film was then re-edited over family-friendliness concerns. Given its December release, the film's marketing campaign was criticized for being a deliberately anti-holiday comedy with taglines like, "Taking the cheer out of Christmas" and "Mishaps. Misadventures. Mayhem. Oh Joy." The premiere for Lemony Snicket's A Series of Unfortunate Events was held at the Cinerama Dome on December 13, 2004. A 20,000-square-foot (1,900 m2) tent display on Vine Street was decorated with pieces from the film's sets. Lemony Snicket's a Series of Unfortunate Events was released on DVD and VHS on April 26, 2005. A Portuguese-labeled All-Region Blu-ray was released in 2012 and then an American Region A Blu-ray was released on September 9, 2014. The film was re-released on DVD on January 24, 2017. Lemony Snicket's A Series of Unfortunate Events grossed $118.6 million in the United States and Canada and $90.4 million in other territories for a worldwide total of $209.1 million, against a budget of $140 million. The film was released in the United States and Canada on December 17, 2004 on 4,400 screens at 3,620 theaters, earning $30.1 million in its opening weekend and finishing first at the box office. In its second weekend the film fell to second behind Meet the Fockers, grossing $12.6 million. It was the highest-grossing film under the Nickelodeon Movies banner until being surpassed by The Last Airbender. On Rotten Tomatoes, the film received an approval rating of 72% based on 162 reviews, with an average rating of 6.7/10. The site's critical consensus reads, "Although it softens the nasty edges of its source material, Lemony Snicket's A Series of Unfortunate Events is a gothic visual treat, and it features a hilariously manic turn from Jim Carrey as the evil Count Olaf." On Metacritic, gave the film a score of 62 out of 100, based on 37 critics, indicating "generally favorable reviews". Robert K. Elder of the Chicago Tribune praised Rick Heinrichs's production design and Jim Carrey for having a balanced performance as a scene stealer. Elder called the film "exceptionally clever, hilariously gloomy and bitingly subversive." Desson Thomson from The Washington Post reasoned over a fellow film-goer's characterization of Count Olaf, "Olaf is a humorless villain in the book. He's not amusing like Carrey at all. To which I would counter: If you can't let Carrey be Carrey, put someone boring and less expensive in the role. In his various disguises he's rubbery, inventive and improvisationally inspired. I particularly liked his passing imitation of a dinosaur." Ty Burr, writing in The Boston Globe, observed, "Director Brad Silberling has essentially made a Tim Burton movie without the weird shafts of adolescent pain. At the same time, Silberling's not a hack like Chris Columbus, and Snicket has more zip and inspired filmcraft than the first two Harry Potter films. The film's no masterpiece, but at least you're in the hands of people who know what they're doing. The movie, like the books, flatters children's innate sense that the world is not a perfect place and that anyone who insists otherwise is trying to sell you something. How you deal with the cognitive dissonance of a $125 million Hollywood picture telling you this is up to you. At least there are no Lemony Snicket Happy Meals. Yet." Internet reviewer James Berardinelli felt that "the film is first and foremost a fantasy, but there are dark currents running just beneath the surface. I give Silberling credit for not allowing them to swallow the film. Lemony Snicket's A Series of Unfortunate Events manages to remain witty throughout." Roger Ebert gave a mixed review: "Jim Carrey is over the top as Count Olaf, but I suppose a character named Count Olaf is over the top by definition. I liked the film, but I'll tell you what. I think this one is a tune-up for the series, a trial run in which they figure out what works and what needs to be tweaked. The original Spider-Man was a disappointment, but the same team came back and made Spider-Man 2, the best superhero movie ever made." Scott Foundas of Variety gave a negative review, criticizing the filmmakers for sacrificing the storyline in favor of visual elements such as set design and cinematography. 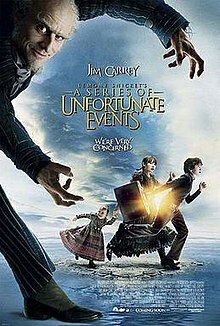 He wrote, "A Series of Unfortunate Events suggests what Mary Poppins might have looked like had Tim Burton directed it. Not surprisingly, Burton's longtime production designer Rick Heinrichs was responsible for the sets, while ace Emmanuel Lubezki (Burton's Sleepy Hollow) contributed the expressionistic lighting schemes." Paramount Pictures, DreamWorks and Nickelodeon Movies hoped the film would become a franchise like the Harry Potter film series. Jim Carrey thought his character would be good as the basis for a film franchise since it would allow him to dive into a new role. "I don't have a deal [for a sequel], but it's one that I wouldn't mind doing again because there are so many characters," the actor explained in December 2004. "I mean, it's just so much fun. It's so much fun being a bad actor playing a character..." In May 2005, producer Laurie MacDonald said "Lemony Snicket is still something Paramount is interested in pursuing and we're going to be talking with them more." In October 2008, Daniel Handler said that "a sequel does seem to be in the works. Paramount has had quite a few corporate shakeups, which has led to many a delay. Of course, many, many plans in Hollywood come to naught, but I'm assured that another film will be made. Someday. Perhaps." In June 2009, Silberling confirmed he still talked about the project with Handler, and suggested the sequel be a stop motion film, with each film being in a new medium, due to the young lead actors having grown too old to continue their roles. "In an odd way, the best thing you could do is actually have Lemony Snicket say to the audience, 'Okay, we pawned the first film off as a mere dramatization with actors. Now, I'm afraid I'm going to have to show you the real thing.'" In November 2014, Netflix announced its plans of creating a television series to adapt the entire novel series. The series stars Neil Patrick Harris, Malina Weissman, Louis Hynes and Presley Smith, with Patrick Warburton as Lemony Snicket. The series, also titled A Series of Unfortunate Events, premiered on January 13, 2017. The first season consisted of eight episodes, and adapts the first four books of the series. A Series of Unfortunate Events season two was released on March 30, 2018, which contains 10 episodes, adapting books five through nine of the novel series. The third and final season was released on January 1, 2019 and adapts the four remaining books in seven episodes. A video game based on the books and film (more so the film, as the name and many plot elements seen in the movie but not the book are seen) was released in 2004 by Adrenium Games and Activision for the PlayStation 2, GameCube, Xbox, Game Boy Advance, and the PC as Lemony Snicket's A Series of Unfortunate Events. The player plays as all three orphans at points in the game, and encounters characters such as Mr. Poe, Uncle Monty and Aunt Josephine, along with villains such as Count Olaf, the hook-handed man, the white-faced women, and the bald-headed man. The game, like the movie, follows only the first three books in the series. Although never mentioned in the game, there are some references to V.F.D., such as in the first level where a package is delivered from the "Very Fast Delivery Service." The note attached to the package also reads at the end, "P.S. The world is quiet here", which is the motto of V.F.D. ^ a b c d "Lemony Snicket's A Series of Unfortunate Events". Box Office Mojo. Retrieved April 8, 2009. ^ Elder, Sean (December 5, 2004). "A Victory for Terror (the Good Kind)". The New York Times. Retrieved April 7, 2009. ^ a b c d e Spence D. (December 16, 2004). "Interview: Lemony Snicket". IGN. Archived from the original on December 8, 2006. Retrieved April 7, 2009. ^ a b Otto, Jeff (March 12, 2004). "An Interview with Jim Carrey". IGN. Archived from the original on March 12, 2007. Retrieved April 7, 2009. ^ Jim Carrey, Brad Silberling (2005). Building a Bad Actor (DVD). Paramount. ^ a b Otto, Jeff (December 15, 2004). "Interview: Jim Carrey". IGN. Archived from the original on October 29, 2006. Retrieved April 7, 2009. ^ a b Paul Fischer (December 14, 2004). "Interview: Emily Browning". Dark Horizons. Archived from the original on September 30, 2007. Retrieved July 16, 2009. ^ Hayes, Dade (May 10, 2000). "Nickelodeon Movies nabs Snicket series". Variety. Retrieved April 5, 2009. ^ Bing, Jonathan (February 26, 2002). "H'w'd stalks crime scribe". Variety. Retrieved April 5, 2009. ^ a b Fleming, Michael (June 11, 2002). "Par on Snicket ticket". Variety. Retrieved April 5, 2009. ^ a b Fleming, Michael (December 12, 2002). "Snicket in thicket". Variety. Retrieved April 5, 2009. ^ a b Fleming, Michael (September 18, 2002). "Jim's juiced for Lemony". Variety. Retrieved April 5, 2009. ^ Fleming, Michael (July 13, 2003). "Diaz sings Jane refrain". Variety. Retrieved April 5, 2009. ^ Fleming, Michael (January 12, 2003). "Helmer leaves Snicket post". Variety. Retrieved April 5, 2009. ^ a b Fleming, Michael (February 19, 2003). "Silberling joining Snicket ticket". Variety. Retrieved April 5, 2009. ^ a b Otto, Jeff (November 22, 2004). "Set Visit: Lemony Snicket's A Series of Unfortunate Events". IGN. Archived from the original on March 22, 2007. Retrieved April 7, 2009. ^ Fleming, Michael (May 7, 2003). "Scribe brings new map to Snicket thicket". Variety. Retrieved April 5, 2009. ^ a b Archerd, Army (December 13, 2004). "Crystal king on B'way". Variety. Retrieved April 5, 2009. ^ a b "Movie Preview: Lemony Snicket's A Series of Unfortunate Events". Entertainment Weekly. August 10, 2004. Retrieved April 7, 2009. ^ Graser, Marc (July 25, 2004). "'Burbs blossom on H'w'd backlots". Variety. Retrieved April 5, 2009. ^ Fleming, Michael (September 13, 2003). "Just ticket for Snicket". Variety. Retrieved April 5, 2009. ^ a b c d Williams, David E. (December 2004). "A Darker Side of Fantasy". American Cinematographer. Retrieved June 20, 2009. ^ a b Trains, Leeches & Hurricanes (DVD). Paramount. 2005. ^ a b An Even More Alarming Conspiracy Involving Sunny (DVD). Paramount. 2005. ^ An Alarming Conspiracy Involving Sunny (DVD). Paramount. 2005. ^ Bloom, David (October 29, 2002). "A fortunate event for Handler". Variety. Retrieved April 5, 2009. ^ McNary, Dave (December 12, 2004). "Lemony-fresh?". Variety. Retrieved April 10, 2009. ^ "Lemony Snicket's A Series of Unfortunate Events (Widescreen Edition) (2004)". Amazon.com. Retrieved April 8, 2009. ^ "Lemony Snicket's A Series of Unfortunate Events (2-Disc Special Collector's Edition) (2004)". Amazon.com. Retrieved April 8, 2009. ^ "Lemony Snicket's A Series of Unfortunate Events (Widescreen Edition) (2004)". bluray.com. ^ "The Top Movies, Weekend of January 14, 2005". The Numbers. Retrieved April 8, 2009. ^ "Nickelodeon Movies". Box Office Mojo. Retrieved April 8, 2009. ^ "Lemony Snicket's A Series of Unfortunate Events". Rotten Tomatoes. Retrieved April 8, 2009. ^ "Lemony Snicket's A Series of Unfortunate Events (2004): Reviews". Metacritic. Retrieved April 8, 2009. ^ Elder, Robert K. (December 15, 2004). "Movie review: Lemony Snicket's A Series of Unfortunate Events". Chicago Tribune. Archived from the original on September 3, 2010. Retrieved April 10, 2009. ^ Thomson, Deeson (April 17, 2004). "A Fortunate Series of Scenes". The Washington Post. Retrieved April 10, 2009. ^ Burr, Ty (April 17, 2004). "Artful direction makes Snicket a most fortunate event". The Boston Globe. Retrieved April 10, 2009. ^ Berardinelli, James. "Lemony Snicket's A Series of Unfortunate Events". ReelViews. Retrieved April 11, 2009. ^ Ebert, Roger (April 17, 2004). "Lemony Snicket's A Series of Unfortunate Events". Chicago Sun-Times. Retrieved April 11, 2009. ^ Foundas, Scott (December 10, 2004). "Lemony Snicket's A Series of Unfortunate Events". Variety. Retrieved April 11, 2009. ^ "3rd Annual VES Awards". Visual Effects Society. Retrieved December 19, 2017. ^ "Past Saturn Awards". Academy of Science Fiction, Fantasy & Horror Films. Archived from the original on May 12, 2011. Retrieved April 10, 2009. ^ Otto, Jeff (May 25, 2005). "Producers Talk Ring 3 and Snicket Sequel". IGN. Archived from the original on December 2, 2006. Retrieved April 7, 2009. ^ Scott, Ronnie (October 2008). "An Interview With Daniel Handler". BookSlut.com. Retrieved April 7, 2009. ^ Ditzian, Eric (June 3, 2009). "Lemony Snicket Director Brad Silberling Plans To Do Each Film In Different Medium". MTV News. Archived from the original on June 7, 2009. Retrieved June 4, 2009. ^ "Netflix Adapting Lemony Snicket's 'A Series of Unfortunate Events' Into TV Show". The Hollywood Reporter. Retrieved November 5, 2014. ^ Kit, Borys; Goldberg, Lesley (January 15, 2016). "Neil Patrick Harris to Star in Netflix's 'A Series of Unfortunate Events' as Showrunner Exits". The Hollywood Reporter. Retrieved March 11, 2016. ^ Gettell, Oliver (January 26, 2016). "Netflix's Series Of Unfortunate Events casts its Violet and Klaus". Entertainment Weekly. Retrieved March 11, 2016. ^ "The Teaser for Lemony Snicket's A Series of Unfortunate Events, Coming to Netflix". ComingSoon.net. October 4, 2016. Retrieved October 4, 2016. ^ Snetiker, Marc (January 11, 2017). "Lemony Snicket speaks out about Netflix's Series of Unfortunate Events". Entertainment Weekly. Retrieved January 12, 2017. ^ Joe Anderton (2018-12-10). "Netflix drops trailer for A Series of Unfortunate Events season 3". Digital Spy. Retrieved 2018-12-14. ^ "Lemony Snicket's A Series of Unfortunate Events Game News". kidzworld.com. Archived from the original on September 8, 2007. Retrieved September 6, 2007.